Colorado Springs offers exciting opportunities for cyclists of all ages and skill levels. Options range from a thrilling mountain bike ride down Barr Trail or the Pikes Peak Highway, to urban bike rentals, to unique guided tours of Garden of the Gods on electric bikes. Colorado Springs and the Pikes Peak region offer biking options that range from a thrilling mountain bike ride down Barr Trail or the Pikes Peak Highway to urban bike rentals and unique guided tours of Garden of the Gods on electric bikes. 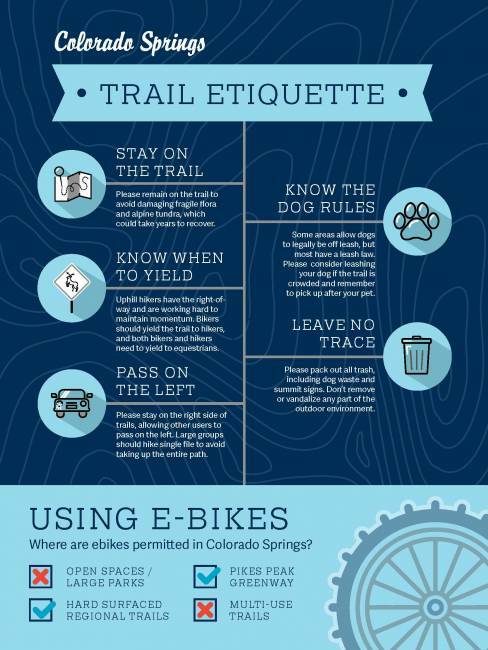 Did you know that Colorado Springs boasts a Silver Status as a Bicycle Friendly Community? Learn more here. Our tour companies offer trips with bikes for visitors who don’t bring their own wheels, so everyone can enjoy a memorable outdoor biking experience in Colorado Springs. Go Electric! Tour Garden of the Gods and other popular areas as they were meant to be experienced- outdoors. No huffing & puffing-you'll cruise on our amazing electric bikes, which make hills and headwinds a worry of the past. Smiles guaranteed. For twenty two years we have accompanied vacationers on bikes down from the summit of America's Mountain Pikes Peak (14,115ft) For a thrill that cannot be duplicated anywhere else in the world we promise you a ride down Pikes Peak will be a thrill of a lifetime. Enjoy breathtaking views of Pikes Peak by mountain bike! We provide fun, safe opportunities for all who appreciate the great outdoors. We also offer a fantastic self-guided tour. Both cater to all skill levels. Guided and self-guided tours. Imagine zooming through pine forests on our amazing trails. The Pikes Peak community has been our home for more than 50 years! Let us share this amazing playground experience with you! Experience the Royal Gorge Region in ways most have not; our fully equipped, guided tours have you explore beyond the pavement. Team Telecycle is your source for bicycles and cycling information. We offer the largest mountain bike rental fleet in the Pikes Peak region. Looking for great bike routes in Colorado Springs? We’ve compiled a list the top trails that are sure to give you the best adventure you can find on two wheels. Pedal your way through nearly 120 miles of urban bike trails and more than 60 miles of unpaved mountain trails.